Paradox by Catherine Coulter is a thrilling race to catch a murderer before it’s too late. Two agents wake up to find their son being threatened by an unknown man in a mask. The man escapes from them. But his threat leaves behind a mass of fear and a start for a new investigation. Little do they know his tie to a bigger and former case will be connected. Until then, they have to be faster and outsmart their enemy. 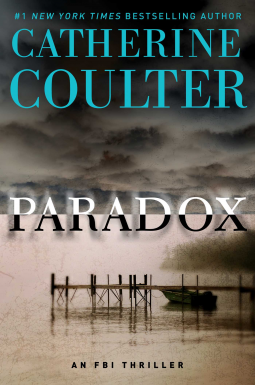 Catherine Coulter creates a suspenseful new tale in Paradox. Immediately, I connected with the agents. Their level of protection for their son was amazing. Being in their field of work, it is understandable to have such security and plans made. It worked. Their plans gave them the alert and saved their son’s life. Their young son is clever for his age. There was a hint of Winnie the Pooh bear somewhere in the boy’s room, which suggested he was still pretty young. But like his parents, he came to the conclusion of what really happened. His parents couldn’t lie to him. I liked that. It made the situation realistic. Then, there was the chase after the criminal and the procedures of starting an investigation. I felt like I was there watching and participating with the agents. The pacing of the plot was quick. I just kept on reading chapter after chapter. My attention was fully caught with this novel. A thriller with enough action and intrigue to keep me reading. Overall, I would recommend it to all fans of Laura Griffin, Heather Graham, and Criminal Minds.